This brooch is a corsage of six maple leaves made from blended colors of enamel from green to pink. The leaves are tipped in diamonds and their stems come together to end with a single pearl in a diamond setting. 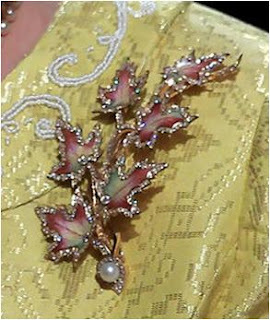 Leslie Field writes in The Queen's Jewels that Queen Mary received an "enamel maple leaf spray" by the ladies of Montreal while on an extended tour of the Realm in 1901, as the Duchess of Cornwall and York. This may have been unseen until the Queen brought it out during her 2010 Canadian tour, so if it is in fact Queen Mary's, it may have had a particularly long nap in the vaults. 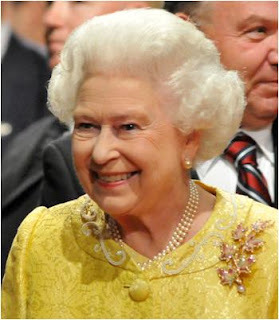 This is an interesting member of the Queen's brooch collection - enamel showpieces are not among her usual favorites. Now that it has been unearthed, I expect it to remain designated for Canadian events.